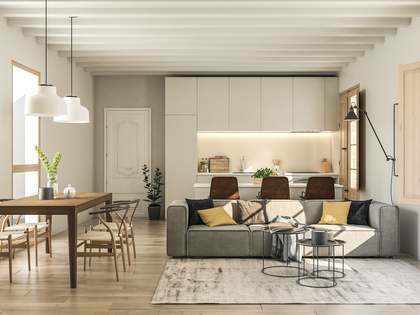 Designer 2-bedroom apartment in an early twentieth century building on a very peaceful street close to the port and the beach in Barcelona Old Town. 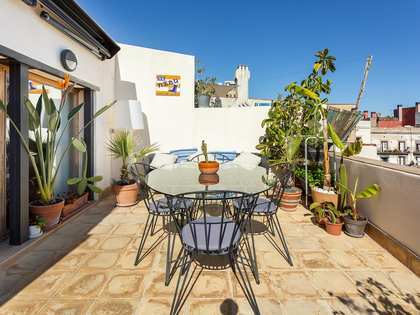 This designer property enjoys plenty of natural light and is located on a high floor of an early twentieth century building on a very peaceful street close to the port and the beach. 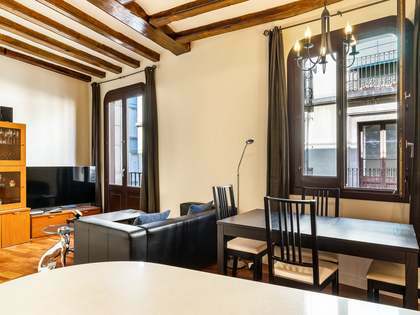 It is just seconds away from Soho House, Plaça Duc de Medinacel-li, Plaça de la Mercè and is surrounded by all amenities, many bars and restaurants. The building has a communal terrace with spectacular views over the Basilica de la Merce dome and a lift is being installed. This apartment offers a great open plan living room – dining room and fully equipped kitchen at the centre of the layout. On either side of the living area we find a double bedroom, each with their own en-suite bathroom. The finishes are of the highest quality and the exquisite interior design makes this a unique and prestigious property. 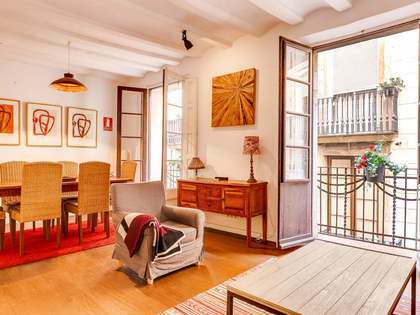 A bright, very well located 2-bedroom apartment with a great style in Barcelona's Gothic quarter. 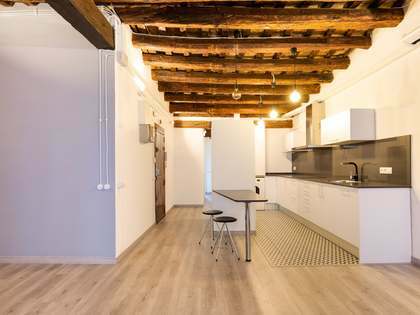 This property is found on a very peaceful street close to the port and the beach in the Gothic quarter of Barcelona Old Town. It is just 3 minutes on foot from Soho House and Plaça Duc de Medinacel-li and is surrounded by all amenities, including public transport as it is 8 minutes away from the nearest metro station and 5 minutes from the main bus stops.